The Nestle Boost Glucose Control Nutritional Strawberry 8oz 27-Case, Model #36030000, is anchored in advanced science and research. Nestle Healthcare Nutrition offers nutritional solutions for people with specific dietary needs related to illness, disease states or the special challenges of different life stages. 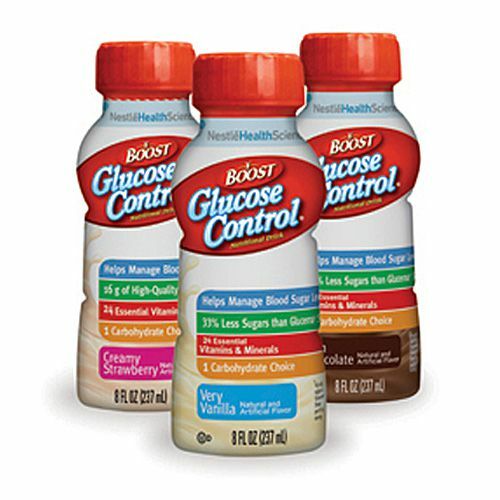 The Nestle Boost Glucose Control Nutritional Strawberry 8oz Case of 27 is a balanced nutritional drink specifically formulated for people with diabetes. It contains a unique blend of protein, fat and carbohydrates, designed to help manage blood glucose levels as part of a balanced diet and with just 1 Carb Choice per 8 fl oz serving compared to 2 Carb Choices per 8 fl oz serving of Glucerna Advanced shake. Boost glucose control is a great choice for anyone managing their carb intake. When your busy schedule makes healthy eating difficult, Boost glucose control can help. It contains 190 calories and is packed with 16 g of protein (30% Daily Value) to help manage hunger while being convenient and nutritious option as a mini meal or snack. 16 g High Quality Protein. 15 Essential Vitamins and Minerals. Antioxidants: Selenium and vitamins C & E.
3 g of Soluble Fiber. Case of 27 Boost Glucose Control 8oz bottles. Ingredients: Water, Milk Protein Concentrate, Tapiocadextrin, Vegetable Oil (Canola, High Oleic Sunflower, Corn), and Less Than 2% Of Fructose, Soy Protein Isolate, Sodium Caseinate, Calcium Casinate, Inulin (From Chicory), Partially Hydrolyzed Guar Gum, L-Arginine, Calcium Phosphate, Citric Acid, Sodium Ascorbate, Soy Lecithin, Salt, Cellulose Gel and Gum, Magnesium Phosphate, Alpha-Tocopheryl Acetate, Choline Bitartrate, Natural and Artificial Flavor, Choline Bitartrate, Carrageenan, Ascorbic Acid, Sucralose, Ferrous Sulfate, Zinc Sulfate, Niacinamide, Calcium Pantothenate, Manganese Sulfate, Vitamin A Palmitate, Copper Sulfate, Pyridoxine Hydrochloride, Vitamin D3, Thiamine Hydrochloride, Riboflavin, Chromium Chloride, Folic Acid, Beta-Carotene, Biotin, Potassium Iodide, Phytonadione, Sodium Selenite, Sodium Molybdate, Vitamin B12. *Percent Daily Values are based on a 2,000 calorie diet, your daily values may be higher or lower depending on your calorie needs.